One size: 195cm (76.75in) wingspan (tip to tip) by 42cm (16.5in) deep. 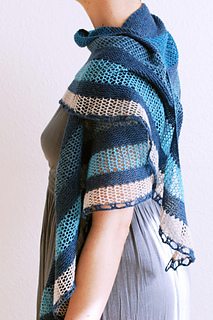 This shawl is from the ebook Coast: A Celebration of Sea and Sky. 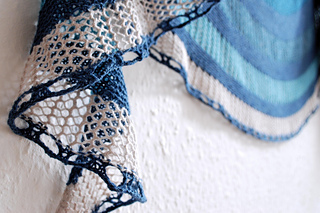 Pwani is a celebration of the sea, and is the perfect relaxing summer knit. 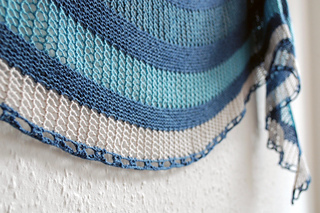 Easy mesh panels are framed by soothing garter stitch. 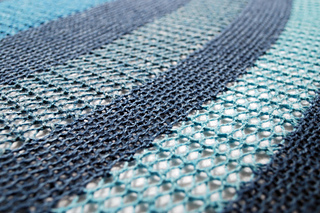 Simple, familiar stitches are a joy to work. You never need to count to more than two and each section can be worked until your yarn runs out. Easy to wear and incredibly versatile, this deep, wide crescent shape will slot right into your summer wardrobe. Mabel and Ivy Coast creates a fantastically light and airy fabric with the perfect balance of cool cotton and a touch of warmth; just what you need on a breezy summer evening. The dazzling array of colours available in the Mabel and Ivy Coast range mean there is a colour combination for everyone. 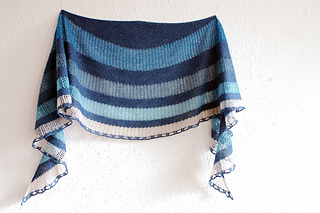 Each shawl uses 100g; a single skein of the main colour and one Coast Ombré pack. Rachel and I have put together some inspiring colour combinations for you to choose from, or you could let you imagination run wild. Note on needles: the smaller (3.25mm) needle is only used for the first few rows to create a neater neckline and the larger (4mm) needle is used for a stretchy cast off. 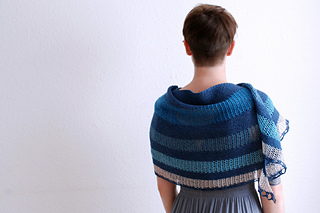 These are both optional and you could happily knit the entire shawl on 3.5mm / US4 needles. 195cm (76.75in) wingspan (tip to tip) by 42cm (16.5in) deep. 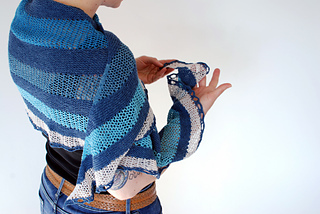 The finished size depends heavily on blocking. 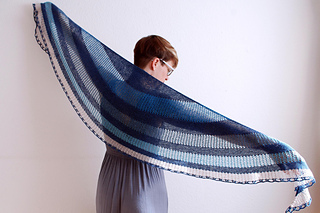 These measurements are given as a guide and are based on a heavily blocked shawl.